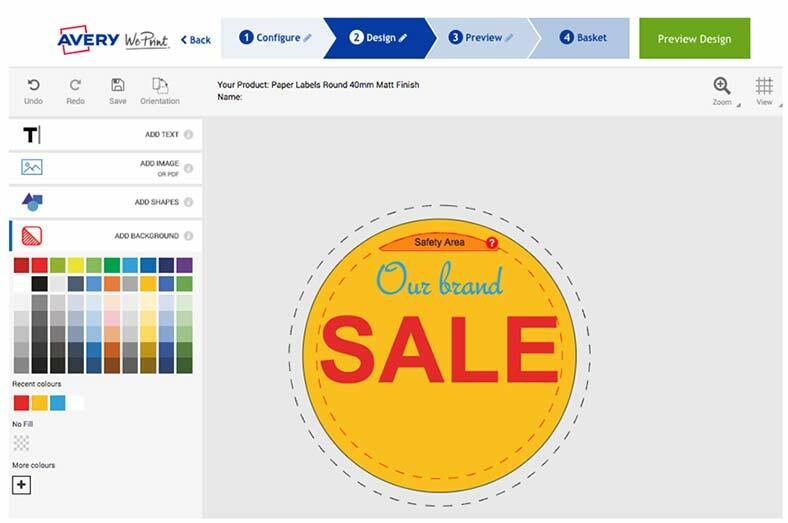 If you getting ready for a sale or looking for stickers you can customise, we have the perfect solution for you. We’ve made it easier than ever to create professional looking, high quality custom stickers. Follow these 4 simple steps to make customised stickers just the way you want them. We’ve made it easier than ever to create professional looking, high quality stickers. Follow these 4 simple steps to make customised stickers just the way you want them. When you click on stickers, you’ll see this page where you choose the shape, and quantity. Follow the prompts to decide on the size material and finish, indicated by the arrow tabs at the top. First, choose a shape from the six options: rectangle, round, square, oval, plaque or straight oval. Then select the size. For round stickers, the Ø symbol means diameter. Sticker sizes start at around 20 mm and rectangular stickers go up to almost 200 mm in length. 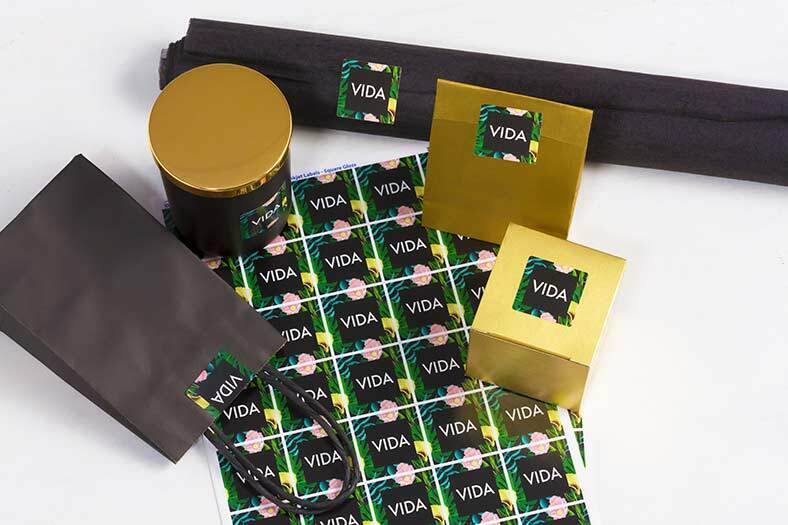 For the material, your custom stickers can be paper, textured paper, plastic, waterproof or clear. Textured paper is a premium off-white material and waterproof stickers are made from ultra permanent, durable thick film that’s specially designed for prolonged periods in water. You can order your stickers in small quantities if you’re trying out a sticker design or you don’t need many. But there are great discounts on larger orders. If you don’t see the amount you want listed, click on ‘Custom quantity’. You can decide on the quantity later on in the process if you’re not sure at this stage. If you change your mind about the shape, size, material or finish, just click on the numbered tabs at the top to go back. When you’ve configured your stickers, click on the green ‘Start designing’ button beneath the quantities and prices. The next screen lets you choose between designing your stickers with the Online Design Tool or uploading finished artwork for your stickers as a PDF file. If you want to design online, choose either ’Use a blank template’ which will give you a blank sticker to work on in your chosen shape and size, or ‘Select pre-designed template’ which brings up a wide selection of professional designs for your sticker shape. In the Design Tool, you’ll notice that your sticker shape appears with two dashed lines inside and outside the border. The inside line shows the safety area for key elements like text that you don’t want to get cut off during the printing process. The outer line shows where your design must go up to if you want your design to cover the whole sticker, right up to the edge. While being simple to use, the Online Design Tool gives you a huge amount of freedom to customise your stickers. It includes many features that are normally only available through expensive design software. You can add a background, as well as images, shapes and text – just pull on the small circles at the corners to adjust the size. Text can be straight or curved with around 100 fonts to choose from! If you choose a pre-designed template, all the elements are fully customisable. Whenever you click on a shape or text box, a panel appears with options to add colour, to replicate it, to delete it and to bring it to the front or place behind other objects in the design. Click on the three dots in this panel for even more really useful options to make it more transparent or adjust the angle and alignment. There’s no end to what you can do! All images and boxes of text or shapes have a small circle underneath that you can move to easily change the angle. When you’re happy with it, click the ‘Preview’ arrow tab at the top. At this stage, you can see your design without the guidelines so you can check it’s all correct. If you want to change something, use the arrow tabs at the top of the screen to go back to Step 2. At this stage, you can also alter the quantity, material and finish (depending on the material). You can check shipping options too. Click the red box to confirm you have reviewed and approved your design and add it to your basket. The final stage is to review your order, apply any promotional codes and proceed to the Secure Checkout. That’s all there is to it! Now you can relax knowing that your printed custom stickers will soon arrive.